Pelican Beach Resort is a complete family getaway located right on the beach in the heart of Destin. This beautiful gulf view unit offers everything you need to feel right at home while you’re on vacation, starting with the king bedroom/ full bath suite complete with your own TV. From the kitchen you will be able to see breath taking ocean/gulf views. This condo sleeps six comfortably, there are full size bunk beds with each bed having individual private lighting. There is also another extra large full bath that is totally handicap accessible. The living room has a sleeper sofa, tv, stereo and dvd player. There is a private balcony, just off the living room overlooking the beach. This property is wheelchair accessible so the halls and doors are wider. Even though you may not wish to dine out for every meal with all the fine dining options so close by, you have the option to cook in the fully equipped kitchen. There is an outdoor barbeque area located at the indoor/outdoor pool. Pelican Beach Resort's amenities include a large convenient boardwalk to the beach, onsite security, indoor/outdoor heated pool, hot tub, fitness area, shuffle board, tennis, kiddie pool, arcade room, and even a convenience store with a deli! With all this, plus the area attractions you will have everything you’ll need for even the most discriminating vacationer. This beach front property is in the heart of Destin's beach front strip, all very close to award winning restaurants, shopping, and attractions like the Track Amusement Park, Big Kahunas Waterpark, and numerous night spots. The Emerald Coast, is on the western panhandle of Florida, is often referred to as the “Sugar Beach” because the nearly pure white super fine silica sand which has nearly the consistency of sugar. These super refined crumbs of the Appalachian Mountains are 97% pure silica sand that has been washed down for thousands of years. It is so soft it will squeak under your feet. Little wonder this is considered one of the finest beaches in the world! Frommer’s magazine named the Florida Panhandle and Destin, as one of the top ten most beautiful places in the world for 2010! Have Travel Memories was presented the “Rated Excellent” award for 2011 & 2012 by FlipKey and TripAdvisor. Please write a review and rate your stay on these sites and our website as well as like our Facebook page. We are independently owned and not affiliated with any resort. We use dynamic pricing so rates are only valid until midnight. Prices are subject to change without notice. Book today and lock in your rate. The stay was fantastic. The room was beautiful and the view was amazing!!!!!!!! The condo was very good in every way. Very nice. Good access to the beach. We loved to stay at this property. Hopefully other people will enjoy the same as we are. We had everything we needed in the condo. The view was great and a very short walk to the beach. The bed was oh so comfortable and we would stay there again. However, there was a little lacking in the housekeeping. There was a sock left in the dresser drawer and face cream left on top of the dresser. The 4 compartment dish on top of the kitchen bar had sand and dirt in it. These were minor issues but we figured you needed to know this. We had a fabulous time our first trip here and we will definitely return. The place was great!!!! I enjoyed my stay in Destin very much, The Gulf view from my balcony would do travel posters proud. 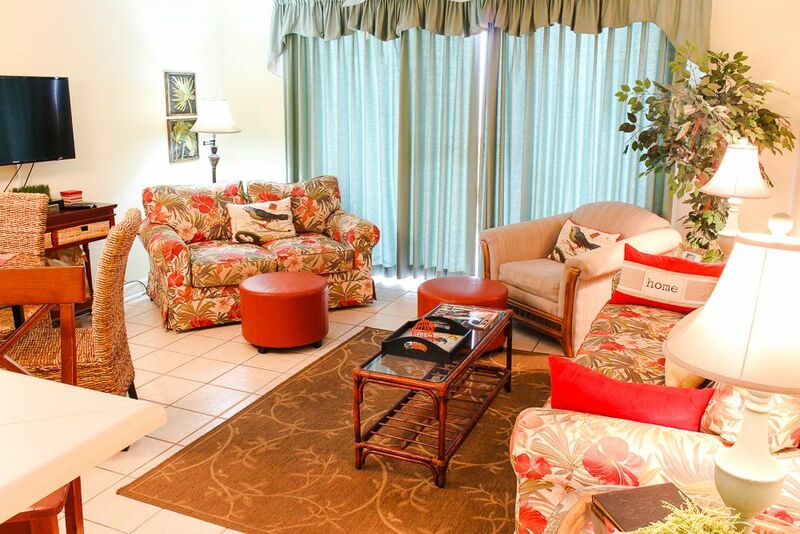 The unit was very comfortable and was furnished nicely in a 'beachy' style. One of the two bathrooms would accommodate folks with disabilities. I was able to get into an informal golf league and got to play 2 days a week which is something that I can't do up North in the snow. Free Tennis included 1st come 1st serve, indoor pool, out door pools, game room, Sauna, Tiki Bar, Large Deck, 1 of 4 Wheel chair condos in the building making the living area larger than most.